Will The Surge In Corporate Profits Bring Stronger Job Growth? 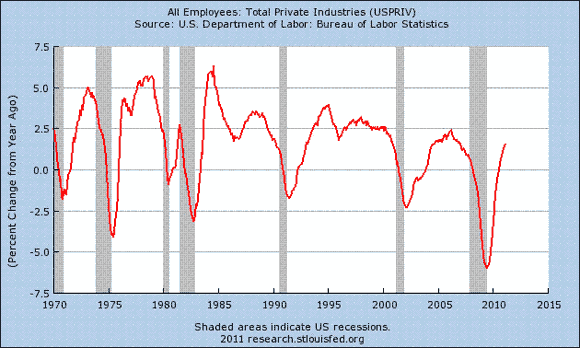 HomeBusinessWill The Surge In Corporate Profits Bring Stronger Job Growth? Corporate profits have soared since the Great Recession was formally declared at an end as of June 2009. Employment, by contrast, has had a tepid recovery. Is this a mismatch with legs? Or is job growth finally set to impress the crowd? Private nonfarm payrolls are higher by 1.5% through last month over the past year on a seasonally adjusted basis. A charitable analysis says that’s no better than middling compared with employment rebounds after recessions in the past. Then again, the final chapter has yet to be written for this cycle. As the chart below shows, it remains to be seen if the job market continues improving. Based on the rolling 12-month change in private nonfarm payrolls through last month, however, the labor market has hardly distinguished itself with strength. It’s a different story with corporate profits, which have exploded skyward recently on an annual basis, reaching record-high advances. 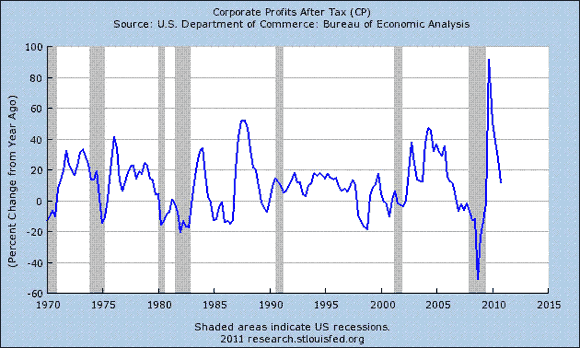 The pace has fallen, but corporate profits remain near an all-time high? Why the disconnect between the renewed health of the corporate sector and job growth? But some economists say that the robust rise in corporate profits are extraordinary and don’t necessarily reflect a healthy economic recovery. If so, one might wonder about the labor market’s strength from here on out. “If you are looking at where profits are coming from … cost control, strong capital discipline, strong control over the balance sheet – that’s why you’ve seen this extraordinary recovery in profits, even though top-line growth hasn’t been spectacular,” opines Aaron Smith, a senior economist at Moody’s Analytics. If the corporate excess saving glut just equaled zero, i.e., firms invested and saved at the same rate, the unemployment rate would be 5.8%. Now, if the corporate saving glut fell below zero to -2%, i.e., firms reinvested in the economy by way of capital investment in excess of saving, the simple model implies an unemployment rate of 4.7%. The government doesn’t need to add jobs, per se, the government needs to figure out how to get corporate America to drop the saving glut and re-invest in the economy. Unemployment, of course, is a lagging indicator and so history reminds that this is among the last of the economic metrics to show signs of life. Given the depth of the Great Recession, the optimistic view is that payrolls have suffered longer than usual but better days are finally coming. “We’ve had the unemployment rate drop a full percentage point very quickly over just four months and that’s nearly unprecedented,” observes Ellen Zentner, senior economist at Bank of Tokyo-Mitsubishi UFJ Ltd.
That implies that job growth is poised to catch up with the dramatic rise in corporate profits. Maybe, but if payrolls stumble in the months ahead, it’s going to get a lot tougher to be an optimist on the employment outlook. James Picerno is a financial journalist who has been writing about finance and investment theory for more than twenty years. He writes for trade magazines read by financial professionals and financial advisers. Over the years, he’s written for the Wall Street Journal, Barron’s, Bloomberg, Dow Jones, Reuters.